Mary Edwards Walker was born in 1832, to parents adamantly opposed to slavery and committed to equal rights for both genders. In an unconventional upbringing, she was encouraged to wear comfortable, practical clothing, instead of the corsets and dresses common in her era, and she received the same education as a boy. She was the only woman in her class at medical school and one of the first American women to become a medical doctor. When she married another physician in 1855 the word "obey" was omitted from their vows, and she retained her last name. Believing that conventional women's wear constrained movement and added to the illusion that women should be judged by appearance, both bride and groom wore a suit and top hat. At the outbreak of the American Civil War she tried to join the Union Army, but was refused commission due to her gender. 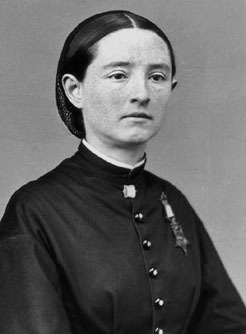 She then volunteered as a nurse at an Army hospital in Washington DC, and served as a battlefield nurse in title while doing the work of a surgeon. She made her own military uniform (modifying the standard male garb), wore two pistols at all times, and tended the wounded at the First Battle of Bull Run and the battles of Chickomauga and Atlanta. After more than two years of volunteer service, she was promoted on the field by General George Henry Thomas to the rank of "Contract Acting Assistant Surgeon (civilian)" in the Army of the Cumberland. She later served as assistant surgeon of the 52nd Ohio Infantry. Walker provided medical care for injured civilians on both the Union and Confederate side, repeatedly crossing alone into enemy territory on horseback. On one of her Southbound missions she was arrested as a spy, and held for four months at a Confederate prison in Richmond, Virginia. She was released in a prisoner exchange that allowed some three dozen physicians to return to their respective Armies, and she later said she was delighted to have been part of a "man for man" swap. For valor on the battlefield, she was recommended by Generals William T. Sherman and Thomas for the Congressional Medal of Honor, and on 11 November 1865, she became the first woman to receive America's highest military award. After the war, she resumed her medical practice and worked as a writer and lecturer on women's rights to vote and property, clothing reform, and the dangers of tobacco (which, she said, led to paralysis and insanity). She sued the Election Board in Washington DC in 1868, arguing that as an American she had the right to vote, but her petition was denied. She was a member of the National Dress Reform Association, and frequently wore the radical "bloomers" advocated by her friend Amelia Jenks Bloomer. At her father's death in 1880, she inherited his farm in New York, where she lived for the remainder of her life. She ran for Congress in 1890, and for the Senate in 1892. She testified before Congress in support of the 19th Amendment, and authored an early 20th century pamphlet which was widely read and influential in the growing acceptance of women's rights. Her Congressional Medal of Honor was withdrawn in 1917, when the Medal's requirements were rewritten so that it could only be bestowed for acts of "actual combat with an enemy." She refused to return the medal, and instead began wearing it everywhere she went. On a trip to Washington DC later that year to argue for women's rights, the 85-year-old Walker slipped on the steps of the capital, forcing her to spend her last years at home. She died in 1919, barely a year before the 19th Amendment to the US Constitution took effect, guaranteeing women the right to vote. At her funeral her body was carried in a flag-draped coffin, and she was buried wearing her black suit and tie. Her medal was restored by order of President Jimmy Carter in 1977, more than five decades after her death. She remains the only woman to have ever received the Congressional Medal of Honor.